Silky Brown broke her maiden at Ipswich on Wednesday in the Savco Stud QTIS 2yo plate over 1520 metres, scoring by over four lengths in what was a brilliant performance. The daughter of Captain Sonador who was purchased at the 2016 Magic Millions QTIS yearling sale, for just $30,000, showed above average ability and what good horses can do by making two runs in the race and still having enough class at the end to finish off and power away for an easy victory. “That was a good tough win and you don’t often see horses make two runs in a race and go to the line as strongly as she did today. 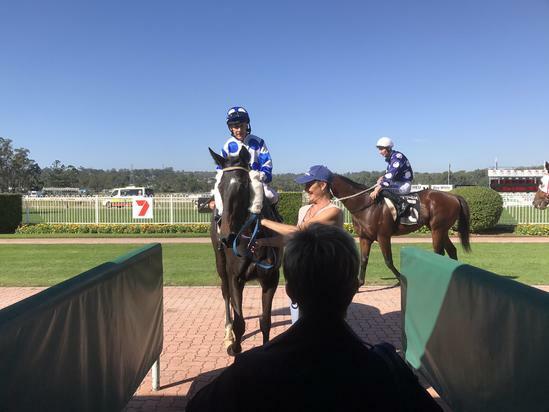 She has shown since day one that she would appreciate when the distances of the races got longer so we just had to be patient and thankfully we were rewarded at her first attempt beyond 1200 metres" Said Guy from the track. "It won’t surprise me at all if she is on an Oaks campaign this time next year"
Lloyd who was having a rare ride for the stable echoed Bryan’s opinion of the filly. “She gave me a great feel today and she feels like all she wants is more distance, it was a good win and she has a nice future” Said the in-form Lloyd. Silky Brown is owned by a large syndicate of owners and was selected by Wylie and Bryan, and co trainer Daniel Guy. “Wylie has been a client of the stable for a few years now and its always great to win a race for Wylie and his team of owners" Said Daniel Guy post race. "This filly wasn’t an expensive horse costing only $30 000 and that has almost been covered by todays good win and by the look of what she did today it won’t be the last time we see those colours winning a race". "That makes it two winners from the three yearlings that Wylie syndicated with the stable last year so the record is pretty good, hopefully now we can step her up to something stronger”. SILKY BROWN has now earned herself a shot some black type on Queensland Oaks day at Eagle Farm in a fortnights time with a nice 1500m race pencilled in for the promising youngster. SILKY BROWN BOLTS IN at IPSWICH from Dalziel Racing on Vimeo.